Christmas Eve on the other hand was an excellent day weather wise and a few good birds to boot! First port of call, Chetney and Funton with 3+Marsh Harrier, 820+ Knot, and an RBMerg. At Lower Halstow, the Whimbrel was in residence on it's usual 'rock' shoreline together with 350+ Brents some of which allowed me to photograph them, plus a Peregrine causing chaos and hassling a male Marsh Harrier. At Motney, very few birds bar a Peregrine and 60 Avocet. Next stop, Copperhouse Lane and 9 cracking Mergs. 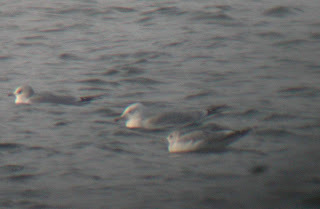 last stop Cliffe with 2 Scaup on the Timber lake and a second winter Caspian Gull in the South Quarry, not a bad day!! 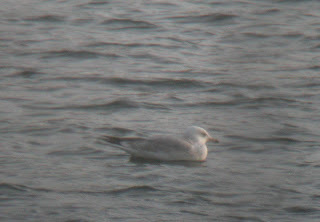 Admitedly the piccies are pretty naff but the light was very poor by then!!! 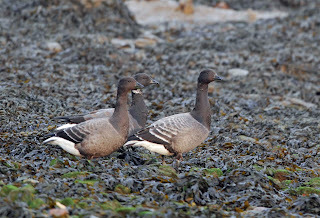 Here's a better photo of some Brent Geese at Lower Halstow the same day! 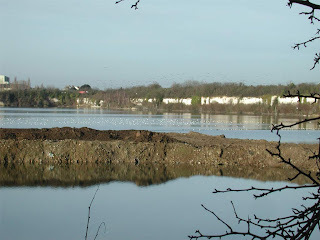 'Bean and Gone' A Livid Goose chase!